One of the most popular authors of historical novels. There are many traces of Western influences noticeable in his best-sellers. His writings can be divided into two parts: first of them are historical novels set to Georgia at the turn of 19th and 20th century, he uses postmodern methods in these novels though. Detective stories belong to the second group and because of these works, he is often compared to Russian Akunin. He uses interesting vocabulary in his works, from Anglicisms to Russianisms, from teenagers' slang to professional jargon and believes that a novel does not necessarily need to start at the beginning and proceed in a straight line to the end. To give an example of his writings, we can mention "Santa Esperanza" (non-linear novel), "Mesaidumlis Kamari" (მესაიდუმლის ქამარი) or "Obolé". Aka Morchiladze, born in 1966 in Tbilisi, is the most talented and recognized contemporary writer in Georgia. He studied and later taught Georgian History at Tbilisi State University; worked as a sport's journalist in a sport's daily and participated in literature–Express within Europe in 2000. Aka Morchiladze's twenty novels and three books of short stories have been published by Bakur Sulakauri publishing since 1998. In 2005-06 he was an author and presenter of one of the most interesting TV programmes to date concerning literature. Several films and plays were based on his works. Currently he lives and works in London, UK. ..."Santa Esperanza" is not a book, but a collection of small rainbow-coloured booklets in a caramel coloured felt slipcase. "These endless covers, this binding, I wanted something different!" says Mordchiladze. He says it's not necessary to read the glorious saga of "The Isle of Hope" from start to finish or even right through. He nearly made the end of "Santa Esperanza" into a crossword puzzle. In this light, the little booklets seem almost conservative. "Dogs of Paliashvili Street" was first published in 1995 and became very popular in 1999, after playing it on Sandro Akhmeteli Theatre stage. It still remains a best-seller as this tragic yet very warm novel is one of the most beloved novels of Aka Morchiladze. This is the story of a reality beyond doubt. In this book, the characters are living around us. This work can make you feel the pain and hope for the future, due to the lack of fruitless peace and love. Aka Morchiladze won several awards. He won the Literary award “Saba” for the Best Novel in 2003, also the same “Saba” in year 2005 for “Santa Esperanza”, in 2006 for “Dream of Venus”, in 2008 for “Maid in Tiflis” and also the Literary award “Saba” for the Best Novel in 2012. In 2010 his romance ‘’ Mamluk’’ was labeled as the best novel of the year by the Ilia State University. ”Maid in Tiflis” is a novel full of stories and adventure. This book contain 13 different substories. Each is a different "door" waiting for the reader to open it. Main characters are friends, two unemployed men, Mogela and Leviko. Mogela is a smoker of hash and afer the dead of Leviko, he still sees him sometimes in his fantasy. He is in love with "Rose of Shiraz". This novel show us the difficult economic situation in Georgia and the fight of young generation of people who goes abroad to live better tomorrows only to lose what binds them together. On October 4 through 5 the 3rd festival of Georgian culture Tbilisoba was held in Andriivsky uzviz in Kyiv. Besides art exhibitions, live music, dancing and cooking of traditional Georgian meals the festival also had a literature component, namely the launch of new translations of Georgian authors within the framework of the literary program in the Ivan Kavaleridze Workshop Museum, organized by literary portal LITFEST. The curators of the presentation Polina Horodyska and translator Gio Arabuli presented three modern novels in Ukrainian translation: A Walk to the War by Aka Morchiladze, Escape from the USSR by David Turashvili, and War Game by Basa Janikashvili. "Of Old Hearts And Sword"-A short, true masterpiece evoking the delicate aroma and atmosphere of Georgia in the early 19th century. "Their behavior is strange and unacceptable for us, but their natural chivalry cannot fail to charm you." – this is how one of the characters of this novel, the wife of a Russian colonel, describes the Georgians. And certainly, Russians could not understand Georgians and their behavior in the early 1800s when they first occupied the tiny country.This tragic story of a young Georgian man who became the victim of this misunderstanding symbolizes the story of Georgia being the victim of the Russian Empire. There is also a passage from this book translate in english. It is tempting—particularly given the paucity of Georgian literature available in translation—to read Morchiladze’s novel as an allegory for Georgia itself: a study of a newly independent country’s self-discovery outside the constraints imposed by a demanding father. But to do so cheapens the compelling, highly personal, nature of Giorgi’s journey; while minor characters can get lost in the novel’s narrative sweep, Giorgi himself never feels anything less than fully developed, fully real. 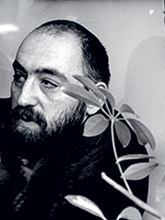 Morchiladze deserves to be read not merely as an example of a Georgian novelist but as a world-class novelist in his own right. aka Morchiladze is a Georgian writer and literary historian who authored some of the best-selling prose of post-Soviet Georgian literature. Morchiladze’s work shows Georgian literature's reorientation in the early 21st century toward Western influences.